The court granted plaintiff's motion in limine to preclude evidence of reexamination. "[E]vidence or argument concerning the Patent Office's reexamination of the [patent-in-suit] is probative of validity; however, in most instances, its probative value is substantially outweighed by its prejudicial effect, as any lay jury would be automatically inclined to defer to the findings of the government agency that issued the patent in the first instance. . . . This decision shall in no way prevent [defendant] from presenting evidence and argument relating to prior art that is properly in evidence, or explaining to the jury that certain prior art references were not before the Patent Office when it issued the [patent] to help meet its burden of proving invalidity by clear and convincing evidence." The court granted plaintiff's motion for summary judgment that its computer access patent was not invalid due to the on-sale bar and the court rejected defendants' argument that a magazine article regarding a product from plaintiff's predecessor using the patented software constituted an invalidating offer for sale. "Reasonably construed, this fails to satisfy the 'clear and convincing' evidence that defendants would need in order to demonstrate a 'definite offer to sell the product,' as such an offer would be understood in contractual terms. It evidences only that [the product] – and its underlying software – was the subject of an article announcing the future availability of the new product. This is not enough to establish a triable issue of fact as to the applicability of the on-sale bar defense." The court allowed plaintiff to present to the jury "a 17-minute video defining a patent and explaining frequent causes of patent litigation that was created by the Federal Judicial Center created 7 years before the alleged infringement in this suit." However, the court also ordered that a statement be read to the jury that "Defendants have other, non-patent-based counterclaims that the video does not address." "Defendants’ argument that the video should be excluded as a discovery sanction for Plaintiff’s failure to disclose this video in discovery or submit the FJC as an expert fails because Defendant cites no case where admission of the FJC’s video is improper. Defendant does not challenge the FJC video as containing inaccurate information." The court granted plaintiff's motion to strike defendant's invalidity defense where defendant pled that plaintiff failed to "comply with one or more of the provisions of the United States Code, including, but not limited to 35 U.S.C. §§ 101, 102, 103 and/or 112." "[T]he affirmative defense for 'invalidity' is insufficient, because there exist several distinct theories of 'invalidity.'. . . This affirmative defense would probably be sufficient with respect to sections 101, 103, and 112 of the Patent Act if it were pled in the conjunctive (so that [plaintiff] was on fair notice that it had to prepare to meet each of these defenses and would not waste its time preparing to meet some defenses that defendant does not intent to assert), but it is pled in the disjunctive, and even if pled in the conjunctive it would not be sufficient with respect to section 102, which alone contains several distinct theories of invalidity." The court denied defendant's motion to disqualify plaintiff's counsel where three of plaintiff's attorneys previously represented defendant in two infringement cases but the matters were not substantially related. "The fact that [defendant] has filed motions to disqualify [plaintiff's counsel] in four other cases undermines its substantially related argument. Each of these patent infringement cases involves a different patent. Under [defendant's] interpretation of the law, [plaintiff's counsel] is likely precluded from ever representing any client in a patent infringement case against [defendant]. This reading of the law is too broad." The court granted plaintiffs' motion for summary judgment on plaintiffs' implied license by legal estoppel defense where the parties' previous covenant not to sue did not expressly exclude subsequent patents in the same chain and the patent-in-suit was a continuation patent of the patents in the covenant. "[Defendant] argues that because the CNS is not supported by consideration, no implied license by legal estoppel can follow. Lack of consideration is not fatal here, however. . . . There is no consideration for the CNS given here; but [plaintiff] and its customers relied on [defendant's] promise not to sue for infringement of the eight CNS Patents under the terms set forth in that agreement. . . . In reliance on the CNS, [plaintiff] has expand its sales worldwide and has indemnified its customers against future suit. . . . Accordingly, [plaintiff] has demonstrated promissory estoppel and satisfies the element of consideration for the CNS. [Plaintiff] has therefore established that the CNS constitutes a valid license. . . . [In Gen. Protecht Group, Inc. v. Leviton Mfg. Co., Inc., 651 F.3d 1355, 1361 (Fed. Cir. 2011), the Federal Circuit held 'where, as here, continuations issue from parent patents that previously have been licensed as to certain products, it may be presumed that, absent a clear indication of mutual intent to the contrary, those products are impliedly licensed under the continuations as well.' The same result applies here, where the CNS does not expressly exclude subsequent patents in the chain." The court denied defendant's motion to dismiss plaintiff's declaratory relief action for lack of personal jurisdiction. "[Defendant] is in a substantially different position from that of a patentee who has merely sent letters of the sort considered in [Red Wing Shoe Co. v. Hockerson-Halberstadt, Inc., 148 F.3d 1355, 1361 (Fed. Cir. 1998) (sending an infringement letter, without more, is insufficient to exercise jurisdiction over an out-of-state patentee)]. [Defendant's] sole business lies in licensing its extensive technology portfolio. It hired an intermediary based in California with the undisputed intent that negotiations between that intermediary and [plaintiff] would take place in this state. Even assuming that [defendant] did not particularly care where [its negotiating agent] performed the necessary preparatory work for those negotiations, it certainly could have foreseen that some substantial part of it might take place in California, as it undisputedly did." The court granted defendants' motion for relief from a prior judgment of no invalidity following remand even though defendants did not directly appeal the validity finding. "The validity of the claims was determined under a claim construction that has been reversed by the Federal Circuit, and this court therefore never considered — and defendants never had an opportunity to argue — invalidity under the claim construction that the Federal Circuit adopted. . . . Because the validity and infringement issues cannot be said to be distinct, it was not necessary for defendants to appeal the validity issue in order for the court to hear the issue on remand." The court denied defendants' motion for summary judgment that plaintiff's patented method for computing medical codes was invalid for claiming unpatentable subject matter. The claims did not satisfy the machine-or transformation test because they (i) "require[d] the use of a general purpose computer for computation, storage, and display [and] these generic functions do not impose meaningful limits on the claims," (the machine prong) and (ii) they "involve[d] . . . manipulating data gathered in a physician–patient encounter and generating a final CPT code [which does not involve] . . . physical and tangible objects" (the transformation prong). Nevertheless, the claims were not invalid because they were not "drawn to an abstract idea." "The [patent-in-suit's] claims are not drawn to an abstract idea. They involve the use of a computer and complex programming and are not drawn to purely mental processes. Prior attempts to solve the coding problems addressed by the [patent] entailed hiring full-time coders who pored over medical records and tomes of information about CPT code criteria to determine the appropriate code. The [patent] claims provide a patentable improvement to the previous methods for determining the CPT codes for a physician–patient encounter. The claims are also subject to meaningful limits. They relate specifically to a physician–patient encounter and involve the determination of a specific type of medical procedure code that is published by the AMA." The court denied defendant's motion in limine to exclude the value of certain components from the royalty base because "the damages that are awarded from infringement of a dependent claim cannot exceed those that are awarded from infringement of the independent claim from which it is derived.” “In support of its proposition, [defendant] cites only a footnote from Wahpeton Canvas Co. v. Frontier, Inc., 870 F.2d 1546, 1553 n.10 (Fed. Cir. 1989). This Court will decline [defendant's] invitation to extend the dicta in Wahpeton into the promulgation of a rule of law by the Court of Appeals for the Federal Circuit." The court denied plaintiff's motion for summary judgment on defendant's unclean hands defense. 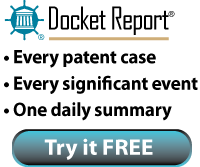 "[Defendant] asserts that [plaintiff's] hands are not clean because it brought this lawsuit 'as a business strategy to drain [defendant's] resources and scare away potential customers,' and not because it had 'a good faith basis to believe that [plaintiff] was infringing the patents-in-suit.' . . . [Defendant] relies on [plaintiff's vice-president's] statement that the 'primary goals' of this lawsuit were to divert resources from [defendant] and to prevent potential customers from seriously considering [defendant's] products. The court concludes that is sufficient evidence of [plaintiff's] unclean hands to allow the defense to be presented to the jury." What Makes Docket Navigator Different? Here at Docket Navigator, we're asked nearly every day "What is so different about your service? Don't we already have something like this?". The following video answers these questions and explains what makes us different. The court denied defendants' motion to bifurcate the trial on liability from damages and willfulness. "Defendants argue that bifurcation is necessary to ensure jury comprehension. The inherent complexity of patent cases, the argument goes, imposes an 'extraordinary burden' on the jury; bifurcation is necessary to break up the case into digestible pieces. That argument is most persuasive where the action involves an esoteric technology. Its persuasive force is much diminished in a case, such as this, where the technology at issue is something as low-tech as ladies' undergarments." The court granted in part defendant's motion for attorneys' fees under 35 U.S.C. § 285 and awarded fees beginning from the date claim construction was resolved. "Plaintiffs timely requested reconsideration of the court’s Markman order, timely appealed, and won their appeal, albeit not on a construction implicated in the court’s [order declaring the case exceptional]. Plaintiffs had a right to resolve a claim construction which they believed to be erroneous, even if resolution of that construction did nothing to make their claims of infringement any more meritorious. Having resolved all issues of claim construction, plaintiffs’ persistence in prosecuting a case that was now clearly without merit was vexatious and unjustified." The court ordered lead counsel to meet and confer in person prior to the Markman hearing. "After the matter has been fully briefed and prior to the hearing, lead counsel shall meet and confer in person. Lead counsel shall discuss each and every claim construction at issue, and engage in a good faith effort to resolve any differences. In the court’s experience, parties are often able to, and do in fact, resolve such differences at the Markman hearing. This Order is therefore appropriate to avoid undue expenditure of judicial resources prior to the hearing, addressing issues not truly in dispute." The court excluded evidence of reexamination proceedings despite defendants' argument that such evidence was relevant to show a lack of willful infringement. "It is idle to suggest that the complicated evidence the defendants seek to bring before the jury on the question of willful infringement will not hopelessly confuse them. Data from the [PTO] reflects that 92% of ex parte requests for re-examination have been granted since July 1, 1981. Given the fact that office actions are the norm and do not remotely presage the outcome of the patent process, evidence of the kind involved here will not be helpful to the jury in evaluating the question of willfulness. . . . The evidence will do no more than invite speculation of the most obvious sort. . . . [T]here are limits to a jury’s capacity to make the kind of exceedingly fine distinctions that would be required by the evidence the defendants seek to offer. There are times, and this is one of them, when a limiting instruction is pointless." The court denied plaintiff's motion in limine that defendants had waived their equitable defenses by not raising them in response to plaintiff's motion for summary judgment. "[P]laintiff did not limit its [summary judgment] motion to 'infringement,' but it did not say that it was seeking judgment on 'liability' either. Rather, it said that it 'hereby moves for summary judgment that certain claims of the [patents] are a) not anticipated, b) not obvious, c) enabled, and d) infringed.' The order on summary judgment was limited to those issues; I did not enter judgment in favor of plaintiff on liability generally. Although the question is a close one, I think that plaintiff left enough ambiguity in its motion to preclude a finding of waiver by defendants." The court denied plaintiff's motion to disqualify defense counsel even though a partner at defense counsel's firm was a partner at plaintiff's prosecution counsel's firm at the time the patent-in-suit was prosecuted. "Defendant has carried its burden of demonstrating that [the attorney] did not receive confidential information regarding [plaintiff] from [his old firm], and that disqualification is thus unnecessary. [The attorney's] Declaration states unambiguously that he billed no time to [plaintiff] and had not heard of it until the present litigation. . . . Plaintiff offers nothing beyond the fact that [the attorney] was a partner in the intellectual property group, worked on one occasion with [plaintiff's prosecution counsel] on another project, and could theoretically have accessed confidential documents if he had tried. None of this evidence supports the contention that [the attorney] obtained confidences regarding [plaintiff] while at [his old firm], let alone rebuts his unequivocal assertion that he did not." The magistrate judge limited the parties to the construction of 15 terms across four patents in two cases, despite the parties' request to construe 160 terms. "As a practical matter, the Court questions whether it would be possible to adequately brief 160 terms within the page limits governing Claim Construction briefing. . . . The Court is typically of the opinion that a reasonable number of terms for construction is ten. However, due to the circumstances of these cases, the Court believes that construing fifteen terms would be reasonable." The court granted plaintiff's motion for attorneys' fees under 35 U.S.C. § 285 as part of a default judgment, but reduced the fees claim by 20%. "[A]ssociates — the level at which work on a matter of this type ordinarily is performed — accounted for only about 1.5% of the total time billed. This is an inefficient staffing strategy. . . . The creation and review of draft pleadings, letters and other work product by upper-echelon billing rate lawyers, the failure to use associate level staffing for ordinary services and drafting, the two amendments of the complaint, with two review processes, over a period of a few weeks compels the conclusion that the fees requested by [plaintiff] exceed the range of reasonableness for this kind ordinary patent litigation."